White shirt, with wide shadow stripes. Navy blue v-neck, with thin white stripe in middle and two thin red stripes either side of it. White hem on sleeves. Thin navy blue stripe along shoulder. Embroidered emblem on left breast, with 'FIFA WORLD CUP' and then 'MEXICO'86' (without a space between) centralised in capitalised navy blue lettering underneath. Two embroidered navy blue concentric diamonds on right breast, with 'umbro' in navy blue lower-case lettering underneath. Red numbers on reverse, in the old Umbro font last worn by England on the previous year's tour. Navy blue shorts, with white drawstring. White seams, with two thin navy blue stripes, each edged with a thin outer red stripe. White numbers on left thigh in the same font as on the reverse of the shirt, with two embroidered white concentric diamonds underneath, and 'umbro' in white lower-case lettering beneath them. Embroidered emblem on right thigh. White socks. Solid navy blue diamonds across tops, edged with two red hoops. For the first two games, there was no World Cup lettering underneath the emblem on the shirt, nor was there a number on the shorts. Nineteen England internationals played in the seven games. With the period being such an important one for the national team, no players made their international debuts in the shirt. No one ended their international career in it, either. Lineker's six goals won him the World Cup�s Golden Boot. Hateley's goals in the two World Cup warm-up games in North America, were his last three for his country. Beardsley's goals were his first two for England. Bryan Robson was captain until his dislocated shoulder ended his World Cup. Ray Wilkins captained England for the last time, against Canada. 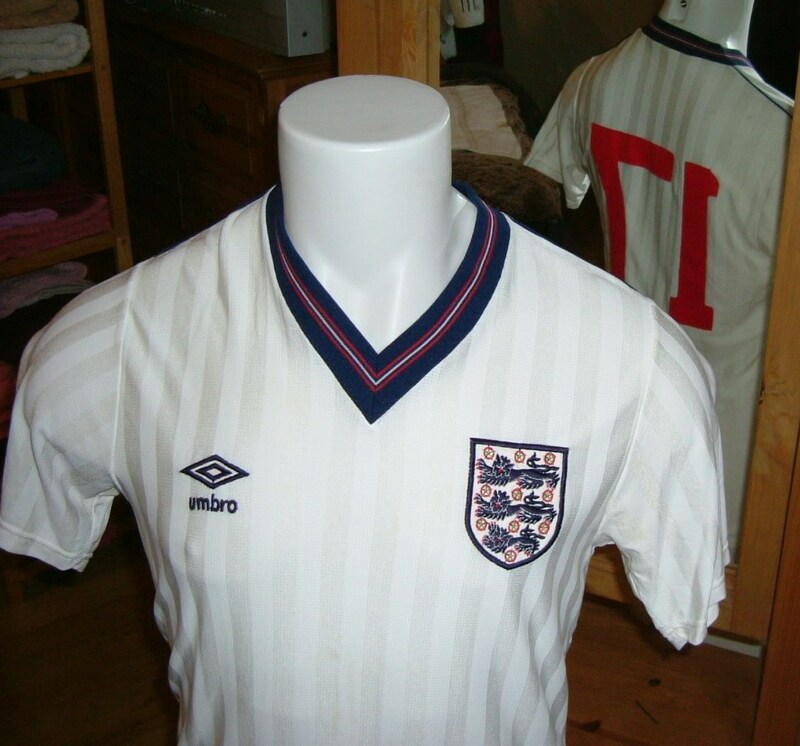 The goalkeeper, Peter Shilton took over the captaincy for the remainder of the World Cup after Robson�s injury but not, of course, in this shirt. It was a confident England that headed for Mexico in 1986 via the USA and Canada. They had been unbeaten for almost a year and a lot of thought had gone into their attire for the upcoming tournament. This was a lighter shirt, but different from the Airtex version worn in Mexico, the previous year. The shadow stripes were thicker and the removal of the cuffs offered more ventilation. There were three warm-up games, beginning with an unofficial 4-1 defeat of South Korea at Denver, Colorado on 14th May. England wore all white, using the shorts from their red World Cup uniform. For the tournament, the finishing touches were added. These were the World Cup lettering underneath the emblem, a first for England, and the addition of the squad number on the left thigh, which was a change to the positioning from the previous World Cup, when it had been on the right thigh. England got off to a slow start. They lost two captains (Robson through injury and Wilkins to a red card) and it took them three games to score a goal, but once Gary Lineker had broken his duck, there was no stopping him as he became the first Englishman to win the prestigious Golden Boot as the World Cup's top scorer. The white shirt was worn in every game, but when it came to the crunch clash with Argentina in the quarter-finals, England were kitted out in a unique combination. The pale blue shorts and socks from one of England's change kits were worn with the white shirt. It was not a lucky combination, unlike Diego Maradona's sleight of hand in giving the South Americans the lead. His second goal was sheer brilliance and England were on their way home. Notes England wore the white World Cup 1986 shirt with the pale blue World Cup 1986 shorts and socks against Argentina. 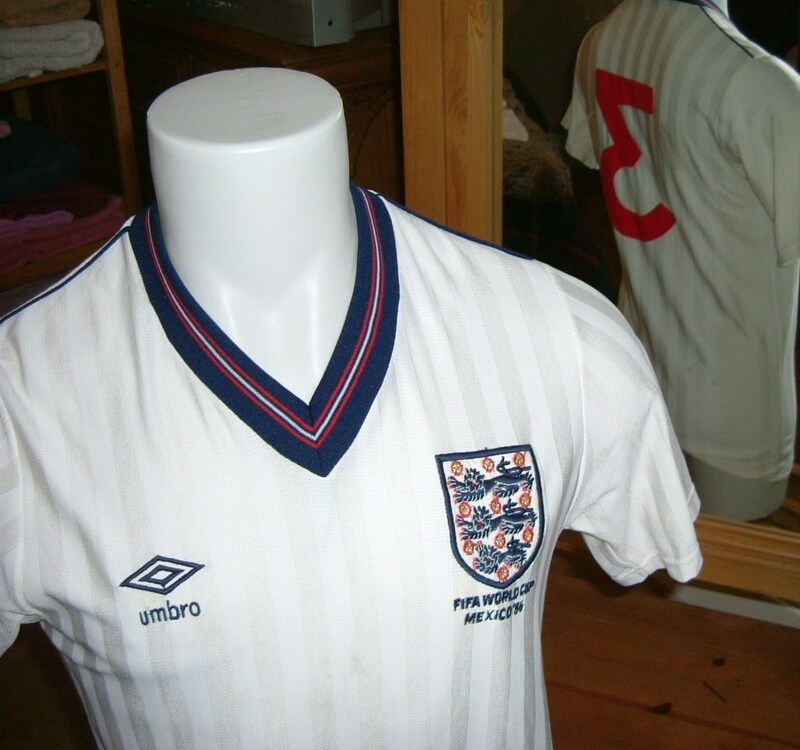 This is the style of shirt worn by England in the World Cup warm-up games i.e. without lettering underneath the emblem.